Great captur eof what looks to be an extremely hectic scene. Geart picture!when I use the keywork "moscow\' search on google, I found the picture that I can\'t miss it, because it is so affective to me, to my eye. I\'m so love this picture just when I see it! Capitalism has won? Hehehe…And now you think you know everything about Russia? Sorry but it\'s a bit perkily to think so.. 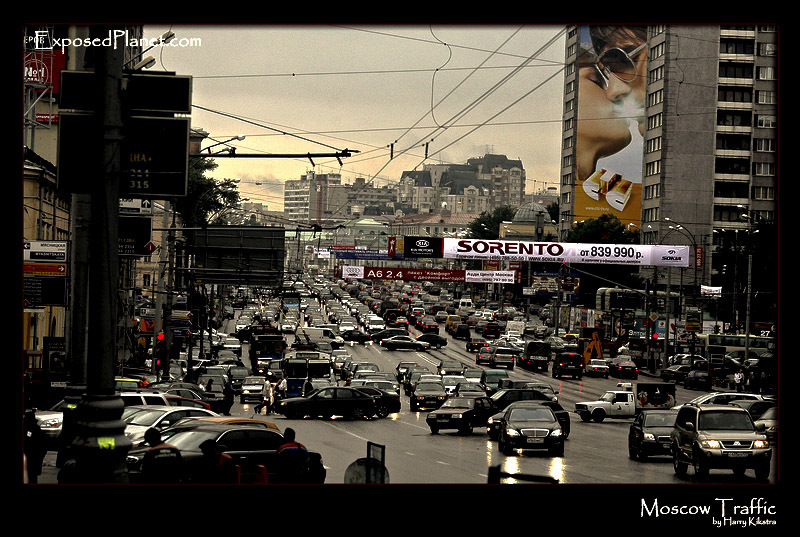 The story behind "Evening traffic in Moscow"
I already mentioned the subway before, imagine if it was not here. Moscow and its 10 million inhabitants would come to a complete stop, something that already happens quite a lot as you can see here on a random day in the week. In the middle of the city is this 12 lane circle road (on of 3 main circle roads! ), completely filled and slowly moving. No bicycle lanes by the way.. The decades of western pressure to make Russia accept western values has worked: also here everybody now wants a big SUV when there is absolutely no need for it. Capitalism has won: now everybody wants to consume.